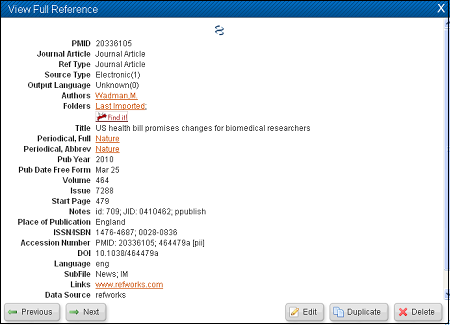 RefGrab-It is a special browser plugin that allows you to automatically import basic bibliographic information about the current web page you are viewing into your RefWorks account. In some cases, RefGrab-It can look up standard numbers such as an ISSN or DOI to retrieve more complete records about the content you are viewing. However, in most instances, citation information acquired from RefGrab-It will not be as complete as records exported from library databases. Note: RefGrab-It cannot be used on .pdf files from web sites. As a browser plugin for Firefox or IE. The following examples show the RefGrab-It plugin for Firefox. First, download and install the plugin in your Firefox browser. Once you have installed RefGrab-It and restarted Firefox, you will see the RefGrab-It icon the lower right corner of your browser window. When viewing a web page or other item of interest, click on the RefGrab-It icon. RefGrab-It will open a "temporary results page" in a new window. 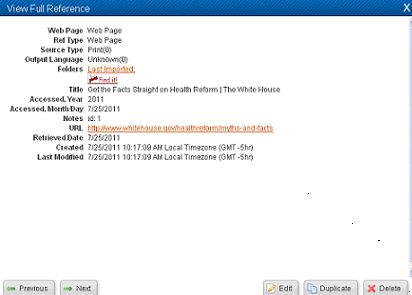 You can view the information and additional resources first, then decide if you want to import the data. 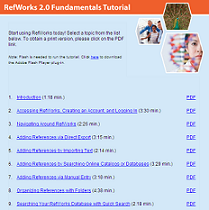 Select the items you wish to import and click the button to import the items to RefWorks; you will be prompted to log in to your RefWorks account, if you have not already. In some cases the information it very basic: web page title, URL, and date accessed. In other cases, additional information about the item can be retrieved from the ISSN, ISBN, or DOI. Check out the Refworks help screens on using RefGrab-It.